SONY BDP-S1500 Lecteur Multi Zone Region Code Free Blu Ray - DVD - CD Player - PAL/NTSC - Worldwide Voltage 100~240V - 1 USB, 1 HDMI, 1 COAX, 1 ETHERNET Connections + 6 Feet HDMI Cable Included. 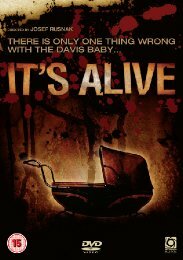 A remake of the 1974 cult classic, It's Alive is a gore splattered cautionary tale of the terrifying consequences of experimental drug testing. Bijou Phillips (Choke, Hostel Pt II, Bully) stars as Lenore Harker, a normal High School senior who seems to have it all: a boyfriend who loves her, great grades and a new baby on the way. Above all, she is certain of one thing, the baby she and Frank (James Murray, Primeval, Being John Malkovich) are expecting is going to be special. The fate of the happy new couple takes a sinister turn as the doctors and nurses delivering their baby are all brutally murdered, leaving just Lenore and her baby miraculously safe. As the police frantically try to unravel the mystery, strange and frightening events begin to occur back at the house. Cocooned in blissful motherhood Lenore is unable to connect the mounting gruesome deaths piling up around her with the sweet child in her arms. As the horrifying truth becomes clear and their home becomes a house of horror, Lenore must choose between ending the life of her baby or sacrificing herself to save the family she loves.